This paper addresses the issues involved with an interior point-based decomposition applied to the solution of linear programs with a block-angular structure. Unlike classical decomposition schemes that use the simplex method to solve subproblems, the approach presented in this paper employs a primal-dual infeasible interior point method. 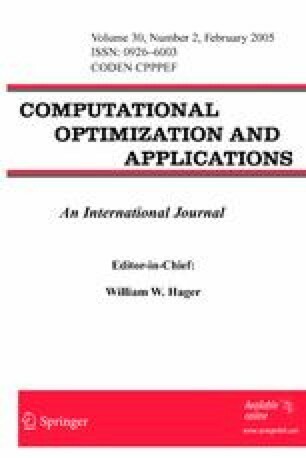 The above-mentioned algorithm offers a perfect measure of the distance to optimality, which is exploited to terminate the algorithm earlier (with a rather loose optimality tolerance) and to generate ∈-subgradients. In the decomposition scheme, subproblems are sequentially solved for varying objective functions. It is essential to be able to exploit the optimal solution of the previous problem when solving a subsequent one (with a modified objective). A warm start routine is described that deals with this problem. The proposed approach has been implemented within the context of two optimization codes freely available for research use: the Analytic Center Cutting Plane Method (ACCPM)—interior point based decomposition algorithm and the Higher Order Primal-Dual Method (HOPDM)—general purpose interior point LP solver. Computational results are given to illustrate the potential advantages of the approach applied to the solution of very large structured linear programs.